In my defence, the joke was told to me by a woman, and I road tested it on three women before posting. All three thought it extremely funny. I'm clearly on the wrong board. Last edited by suffolk on October 26th, 2018, 7:28 am, edited 1 time in total. It doesn't matter any more, Suffs. Come on Gruney It’s not the worst joke in the world but I’d have expected it to come from Bernard Manning rather than you ... you’re a nice thoughtful chap ... but then we all see things in different contexts and with different experiences. We can still be friends. Suffs is right, Gruney. Come on - lighten up. It’s ok Gruneys been in touch he’s just taking a break ... hopefully we’ll hear from him again soon. That's good to hear, Suffs. Hope he does come back as I always enjoy reading Gruney's posts. Good heavens - thank you, Rainbow. Don't be a stranger Gruney!!! An old man was on his death bed, and wanted to be buried with his money. He called his priest, his doctor and his lawyer to his bedside. "Here's £30,000 cash to be held by each of you. I trust you to put this in my coffin when I die so I can take all my money with me." At the funeral, each man put an envelope in the coffin. Riding away in a limousine, the priest suddenly broke into tears and confessed, "I only put £20,000 into the envelope because I needed £10,000 to repair the roof of the church." "Well, since we're confiding in each other," said the doctor, "I only put £10,000 in the envelope because we needed a new X-ray machine for the paediatrics ward at the hospital, which cost £20,000." The lawyer was aghast. "I'm ashamed of both of you," he exclaimed. "I want it known that when I put my envelope in that coffin, I enclosed a cheque for the full £30,000." It's still more than two months to Pancake Day, yet some shops are already selling flour and eggs!! aero280 wrote: It's still more than two months to Pancake Day, yet some shops are already selling flour and eggs!! East Anglia is an anagram of against ale. There must be more like that. It would be fun to find out. 'at a gin sale', 'least again' and 'stale again'. Last edited by scullion on February 11th, 2019, 6:09 pm, edited 1 time in total. His 'Trump Yoga' is good too! It was my wife's birthday. The yoga videos are good but scrolling down the other videos I found some old Pam Ayres clips - so clever, I have just been laughing my socks off. I love comedians who take every day situations and present them in a way which has one howling with laughter. Excellent. ... but the only answer! I saw that earlier. It sums it up really. 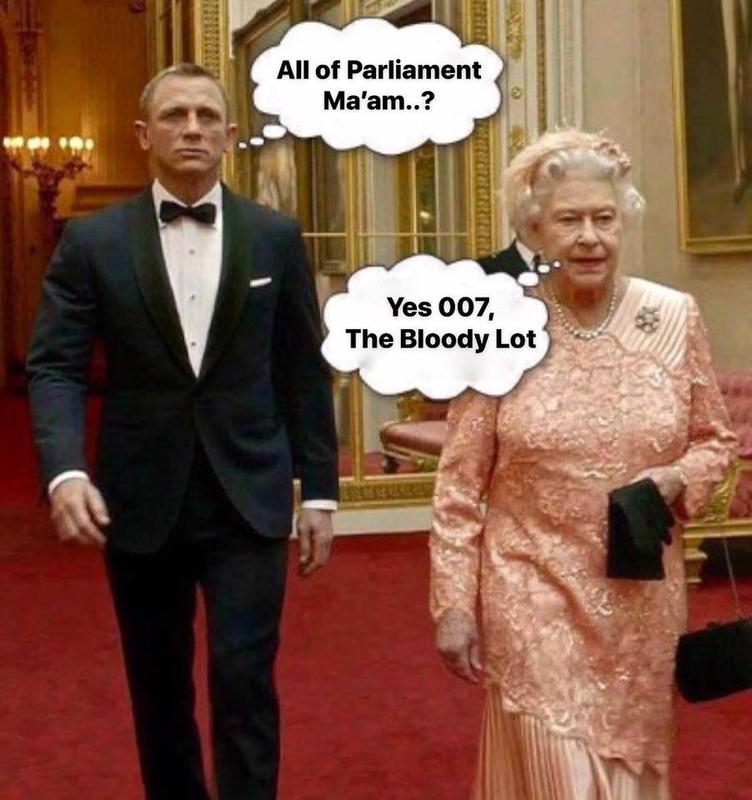 While we are looking at Brexit meme's, here's one from the internet that's been circulating! This isn't a joke as such - but it made me laugh. Yesterday morning,my pal from over the way spent ages fitting a new doorbell to his front door. It was technical, and involved swearing. It was "wireless, and he could take the alarm bit into the garden and he would hear if anyone rang. Later a delivery man arrived - I was watchful, because they are frequently out, and I take stuff for them. The man walked up the drive - and knocked on the door. There are some foreign comedians making jokes about Brexit - how dare they!! "A steak cooked in England, with ketchup and mayonnaise".